Sometimes there are desires in life that take awhile to come to fruition. 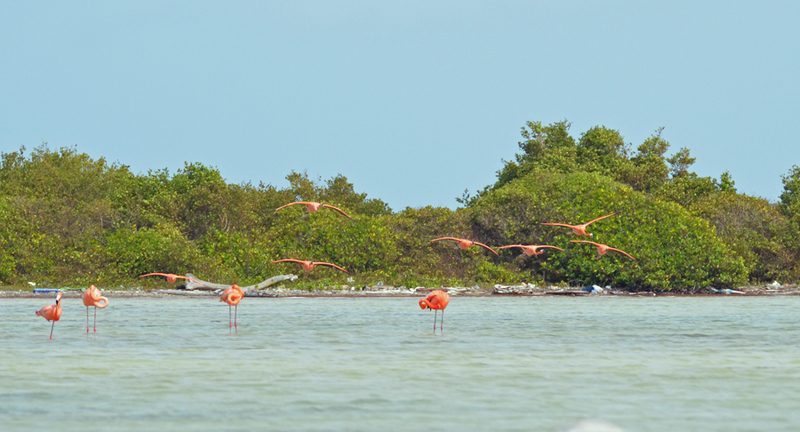 When we were in the Bahamas a couple year ago, I had hoped to see the flamingos on Great Inagua Island. The Inagua Islands are the southernmost islands in the Bahamas. It is reported that there are between 20,000 and 80,000 flamingos each year. The weather was not cooperating for us to go. We could not get that far south and then back to where we needed to be in order to continue our planned journey. We hoped to have better luck in Bonaire. 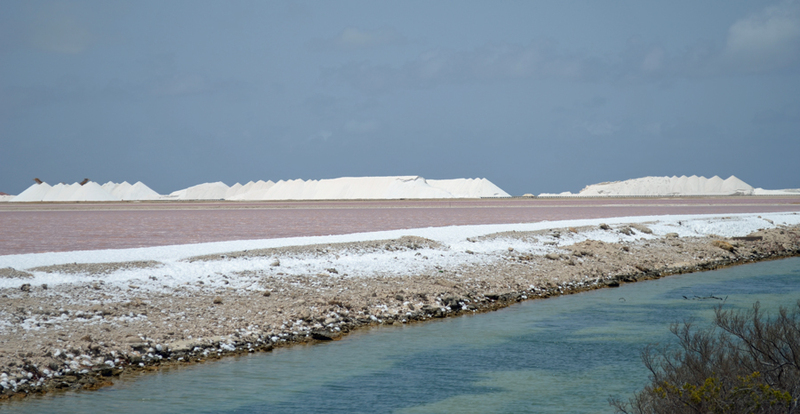 Our stay on Bonaire would not be during the peak months for flamingos to be on the island. There might not be thousands or even hundreds but I would be just as happy to view a small flock or even a few. As we sailed from Curacao to Bonaire we saw three flamingos flying across the water toward Bonaire. Their pink almost orange color was so vibrant against the blue water. How thrilling to see them in the wild. I joked with Mark that now we know there will be at least three flamingos on Bonaire. 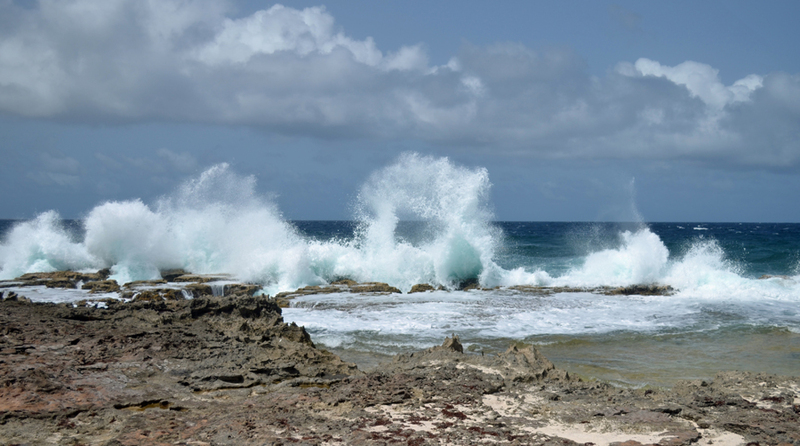 We took our time exploring the western and southwestern coast of the island by rental car. We stopping along the way to take pictures or just enjoy the activities and scenery. 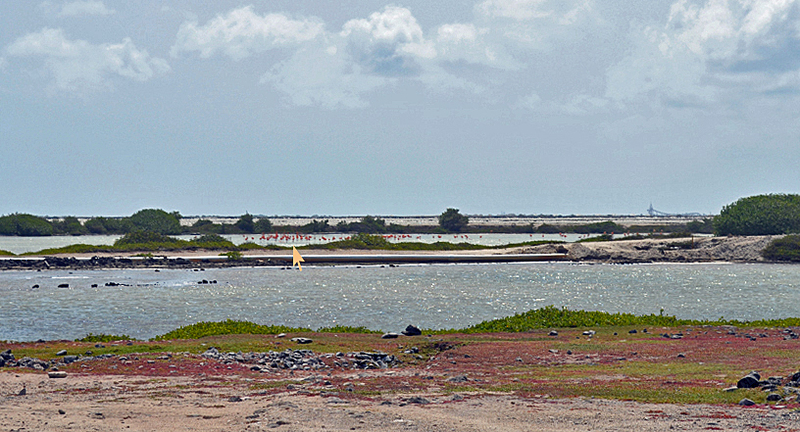 Then it happened, as we rounded the southern tip of the island we saw our first flamingo. It was all alone. We continued our journey to the windward side of the island. 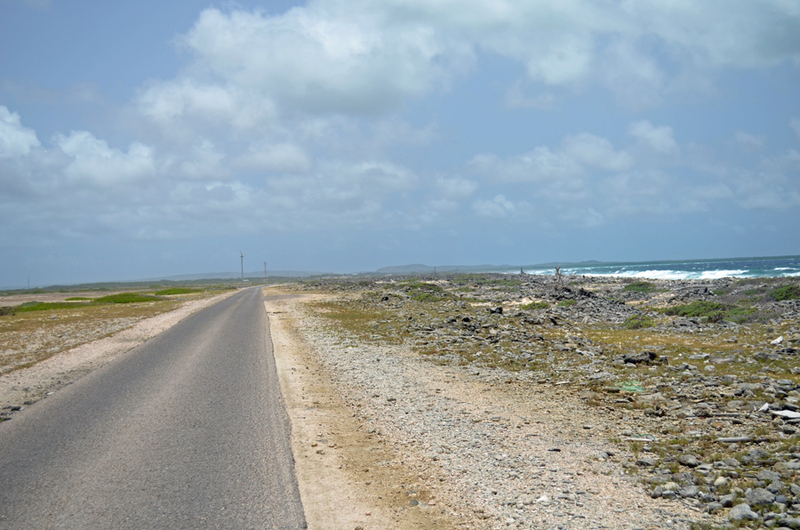 The roads are single lane on this desolate part of the island. There are lay-bys for passing when cars meet from opposite directions. Single lane road on the windward side of Bonaire. A lay-by just ahead on the right of photo. The haze from the blowing dust. I was looking at a pond in the distance while waiting at a lay-by for a truck to blast past. Are those orange blobs? Are those flamingos? Yes! They are flamingos! GRAB THE CAMERAS! The winds were blowing 20 knot (23 mph) with gusts as high as 27 knots (31 mph). The wind was so strong it was very hard to hold the large, heavy camera lens steady even with the aid of a tripod. We sat on the ground to try to steady ourselves and our equipment. The birds were quite a distance away. They were sheltered from the wind by mangroves and small trees. They were happy as clams. Mark had the biggest, most powerful camera lens in our arsenal and the only tripod we brought with us. I was using the next step down in lens size. My legs were my tripod. The cameras got a good workout but the wind won. It was too windy and the birds were too far away to capture a decent photograph. Later that evening we viewed all of our photos. We could not find even one that was not blurry. We decided to get up early the next morning and give it another try. The next day, with fingers crossed, we drove back to the same pond. We were excited to see the flamingos were still there. We were all alone, not another sole or car for miles and miles. Just the wind howling around us and wave crashing on the shore behind us. I put my camera down and enjoyed the scene in front of me. I watched the birds slowly moving around the pond. Preening, stretching, eating. What a peaceful life. I suddenly saw more flamingos in the sky flying toward the pond. I picked up my camera, held it as steady as I could in the brisk wind, hit the button and hoped for the best. What a sight it was to watch. We took close to 100 photos with our most powerful camera lenses. We were very happy to have about 10 good photos of the flamingos. The elements were not kind but we were determined. But most of all, we had a great day doing what we love to do. 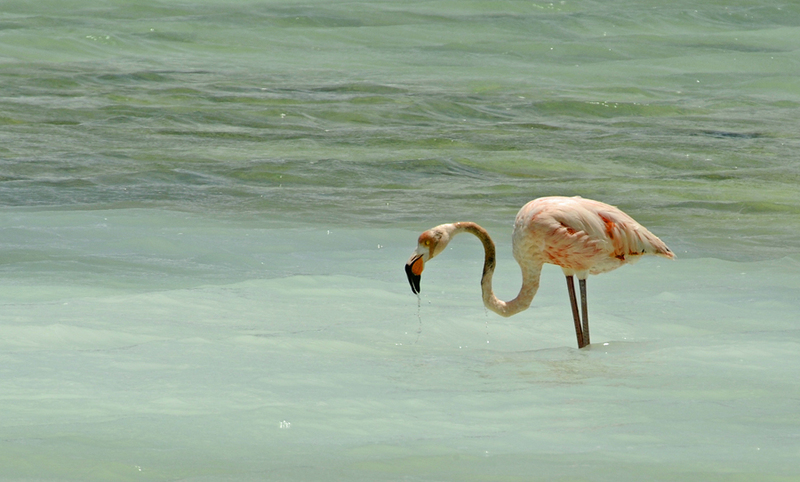 Due mainly to the red carotene in their diet Caribbean flamingo are more vivid shades of pink to almost orange.